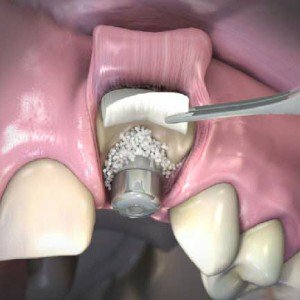 When there is not enough bone for you to have dental implants this may be rectified by bringing new bone into the area i.e. a bone graft. For small amounts bone can be borrowed from other parts of the lower jaw. If much more bone is required a hip graft will be required. What is a hip graft? One of the easiest ways of filling in a hole in a jaw bone is to use bone from the hip. A “hip graft” involves collecting bone from the pelvis above the hip joint. You can usually feel the area of bone that will be used since it forms a bony lump some 6 inches (20cm) above and in front of the hip joint. What will the area be like once the bone has been removed? At the end of the operation the incision will be carefully stitched together. Depending on the amount of bone that is removed a small plastic tube (“drain”) may be placed into the wound. This tube is connected to a bottle and allows any tissue fluid or blood to drain out of the wound. The drain usually stays in place for a day or so. If a large amount of bone has been removed I may put a second plastic tube into the wound before it is closed. Through this tube local anaesthetic can be administered. This local anaesthetic will keep the area numb and help reduce any pain. Your length of stay depends not only on your hip graft but also on the other procedures that you have had carried out at the same time. But you should expect a couple of days in hospital. A cut will be made through the skin immediately overlying the bone that will be removed. The length of the cut obviously depends on how much bone I will need. If I only require a small amount of bone (eg to graft a dental implant site) the incision may only be a couple of inches long. The hip tends to be sore for at least a few days even if only a small amount of bone has been collected. If large amounts of bone have been removed the area may be sore for a couple of weeks. Because the area around the hip is sore you may have some problems walking. Rarely you might need to use a walking stick for a few weeks after the operation. Do I need to do anything when I get home? A dressing will have been put over the hip wound after surgery. You need to keep the area dry until this dressing and the underlying stitches have been removed. You should remember that you cannot drive or operate machinery for 48 hours after a general anaesthetic. If you find walking difficult when you get home you may also not be able to drive for a while because it is only safe to do so when you can safely perform an emergency stop in your vehicle.